Many images cross our screens at the RealTime office each week but something about this one suggests more than meets the eye. Curiosity takes me to Paddington’s Barometer Gallery where photo-media artist Julie Williams ushers me into a darkened annex to view her 13-minute video The Tears. It opens with richly coloured images of the natural landscape near the artist’s home on the western edge of the Blue Mountains, gradually zoning in on a sharply defined tear-shaped hole in smooth red granite. This womb-like waterhole is regarded as sacred by the local Wiradjuri people: “It sits at the head of the east/west flow and is a site for women to tell their stories” (room notes). It is also significant for the non-indigenous Williams. The woman in the video turns out to be the artist herself. From a bed, as if actively conjuring her own dreamscape, she observes and sometimes generates via a switch on the wall the myriad properties of a flowing river. Light breaks across the surface forming patterns, fleeting figures and eventually a sort of liquid calligraphy. Watery sounds meld with the movement of air, birdcalls and finally a strange, pulsing animal cry. 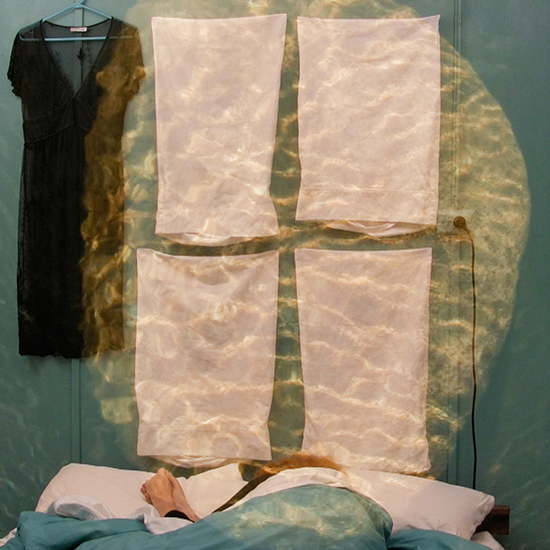 At times, Williams, in what looks like an attempt at psychological immersion, rearranges the elements of her small world and attempts to enter the waterhole projected above her bed. In the gallery, a series of seven subtly coloured still images capture moments from the video. Williams tells me that when she was offered the possibility of this exhibition she was in the throes of a long convalescence from surgery. Returning to water, the source of much of her imagery for the past decade, she decided she would make the work from her sickbed. In this idiosyncratic multi-layered series, Julie Williams, visits a familiar place as a spiritual “point of departure into the landscape” to find her way out of confinement and back into the world.